Europe’s commercial vehicle press descended on a former brandy distillery in Paris earlier this month for the launch of three new digital applications from Michelin Tires. Representatives from Michelin, including Marketing Director for Truck and Bus Europe, Anne Dionisi-Fung and Serge Lafon, Executive Vice President Truck Product Line, gave an overview of a new digitised innovation from the company which they have branded Michelin Tire Care. Following a question and answer session for the floor, the journalists were invited to participate in three individual workshops which explained the new products in more detail. Michelin Tire Care, is a suite of digital tyre maintenance applications that are the result of several years research and development in innovation, part of the company’s €640m annual R&D investment. Aimed specifically at the commercial vehicle sector, the three products have already been trialled in the US and Europe and are available as of now, with continual product advancement and improvements being part of their ongoing strategy. 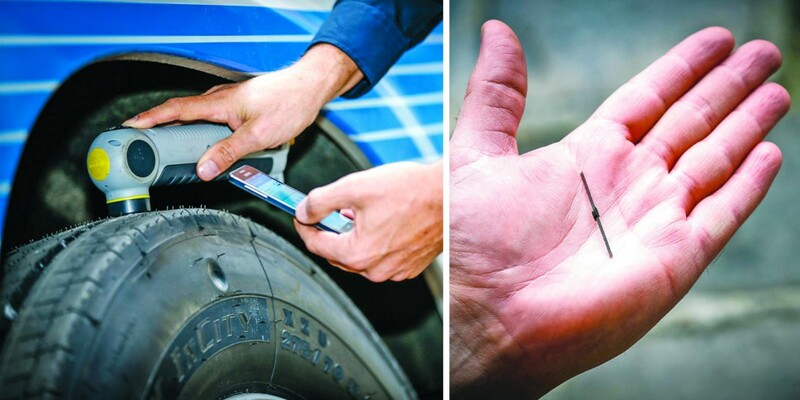 The digital media platforms can be accessed from most hand held devices such as a tablet or smartphone and have a number of key functions; these include reduction in manual inspection and labour time, increased shelf life of the tyre, fuel savings and vehicle safety. Michelin claim that, in Europe, one third of truck breakdowns are tyre related and 90% of these are due to pressure problems. It believes these new systems offer a practical preventative maintenance solution that in return should help to reduce the number of accidents and breakdowns. 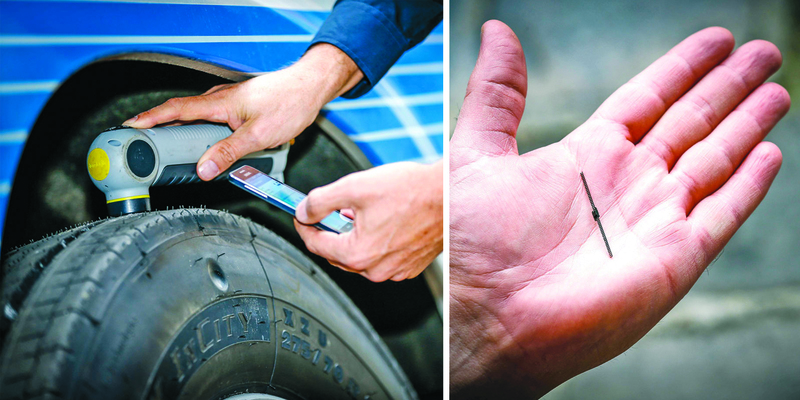 As part of the Michelin Tire Care programme, they will be introducing an RFID (Radio Frequency Identification) chip into their entire tyre ranges from 2016. It is already in the X Incity urban range, which is particularly suited to the bus market and is expected to be in most of their truck and bus range by the end of the year. This smart chip is industry standard technology and works in a similar way to an identity micro chip that your pet dog may have inserted. It is given a unique code and is then fitted inside the tyre where a specialist reader can give accurate information regarding the product’s life cycle. A retro-fit patch has also been developed so that the entire tyre stock of a fleet can benefit from the technology. In its simplest terms TireLog is a digital tyre logbook aimed at operators with less than 20 vehicles that are currently using a manual, paper system. A free smart phone application for both Apple and Android devices, it is a simple and efficient way of managing a fleet’s tyres from wear to stock levels. It is available now from the iStore and Google Play in 11 languages. A screen shot of the TireLog App. This digital servicing notebook is straightforward enough for any transport manager to follow. You simply name each vehicle in your fleet, add the axle configuration from a pre-selected menu and enter the details of each tyre on the axle. There is a simple drop down menu of major tyre brands; Michelin have been wise not to assume that operators are only driving on their products. 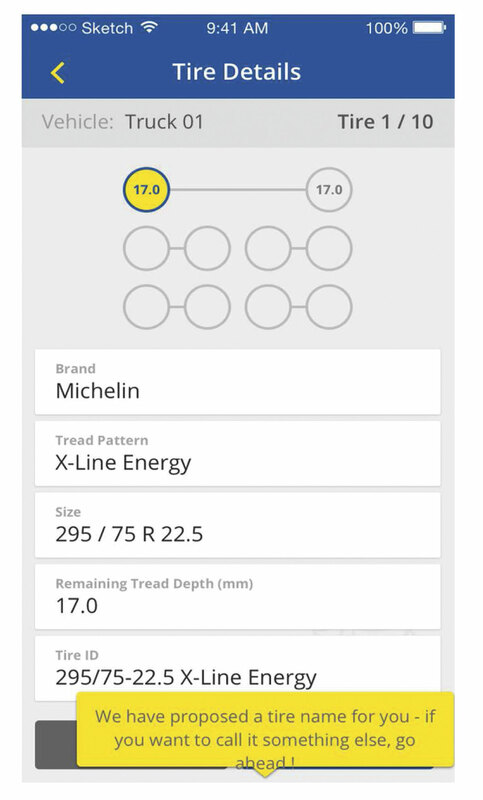 You then select the brand from the list or the options will come available once you start typing, along with the tread pattern and size and enter the current tread depth which is performed using a tyre tread gauge in the normal way. 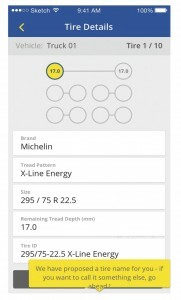 The app is set up assuming that in most cases, the opposite tyre will be of the same type and so an option is available to repeat the data and simply adjust the tread remaining if required. It then presents a visual image of the axle and you can click on any tyre to find out its condition and when it was last logged. Additionally, the app allows you to add a tyre stock, so once these are entered, you can then take a tyre direct from stock when you have physically replaced one. Data can be exported as a PDF and emailed across to any account so that anybody else that needs access to the information can see it. It doesn’t trigger any alerts, for example if you are running a tyre with an illegal tread. It expects you to be the expert and know, but it will show trends and is useful in preventative maintenance such as re-grooving etc. If you require something more interactive, with diagnostic features, then iCheck is the next stage. iCheck is a predictive and optimised tyre diagnostics system aimed at those with a fleet of over 100 vehicles that have an integrated tyre workshop. Operators will need to register for this via Michelin’s MyAccount portal on their website. This is a paid for service and includes the provision of an inspection tool which measures tyre pressure tread depth and miles travelled electronically. Michelin estimate that the average breakdown costs the operator €1,000 and that nine out of ten tyre related breakdowns are due to pressure problems. A tyre that is 10% less inflated than its recommended level can mean a 1% increase in fuel consumption. They also say that the average pull point for tyres across Europe based on information gained from their retread factories was 4.8mm. They suggest that by setting a pull point target that is too stringent, a vehicle can lose approximately 15,000 miles per mm which in turn has cost saving implications. Demonstrating the pressure and depth gauges of the iCheck tyre monitoring system. Trials took place with international logistics company Transport CIE and their feedback was invaluable. Over 300 vehicles, Michelin claimed a saving of €55,800 could be achieved thus; Correct tyre pressure €16,800, saving 1mm of rubber €9,000, cost of breakdowns €15,000. Because the inspection time takes five minutes, compared to approximately fifteen ordinarily, eight days can be saved. The iCheck system costs €4,680 per year which, according to Michelin’s figures, could equate to a €12 saving for every €1 invested. The system can be linked to in-house telematics systems and procurement packages so that stock levels can be easily monitored. Following an inspection, it will automatically flag an alert if there was a problem with the readings and make recommendations. For example, irregular wear patterns may suggest the tyre be relocated to an alternative position. Trends can be monitored and formatted in tabular and graph form for ease of analysis and presentation to the management team, thereby offering reactive and preventative information. iCheck also manages the multi life cycle of a tyre by recommending retread and re-grooving options to save both rubber and money. This system does not read an RFID chip, it is iManage that specifically does this. 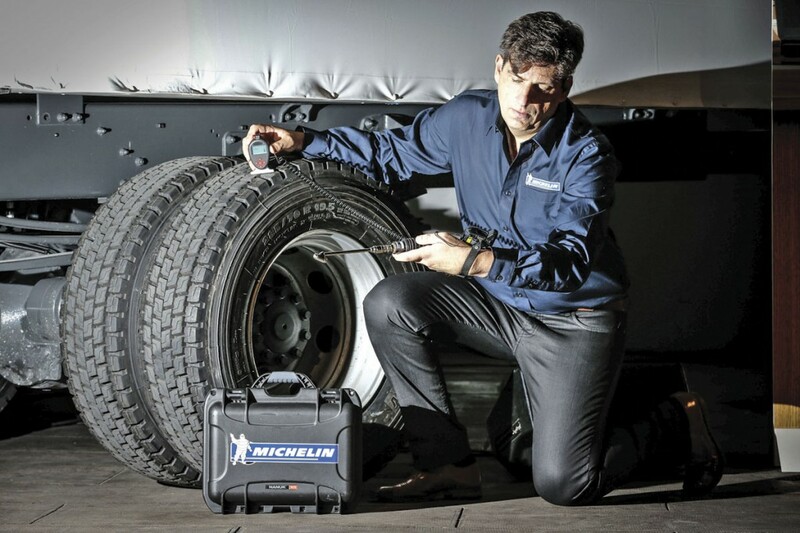 The iManage solution is Michelin’s premium tyre care product which enables every tyre to be tracked individually throughout its life-cycle, offering complete traceability. It is aimed at operators who run fleets of 100 plus vehicles, that has its own maintenance workshop. Trials of it were conducted on 1,200 urban buses in Italy. In addition to an RFID chip, which is inserted during the manufacturing process, the tyre is also fitted with a TPMS (Tyre Pressure Monitoring System) and temperature sensor. These provide comprehensive information as to the correct pressures, degrees of tread wear and the overall condition of the tyres whilst integrating stock availability. As with the entire Michelin Tire Care programme, the emphasis is on improving tyre safety, reducing accidents and down time, decreasing fuel consumption, reducing costs and improving tyre mileage through preventative maintenance. The hand held scanner on the iManage system instantly reads the RFID data and transmits it along with tread and inflation data straight to the smartphone. Right. The RFID ‘chip’. Estimates during the 1,200 vehicle trial suggested that an annual saving of €331,900 could be made. This was broken down as €84,700 from the tyre budget, €30,000 from emergency breakdowns, €17,200 saved from vehicle inspection time and €200,000 fuel saving. iManage works on real time information and everyone that has the app will be alerted should there be an issue. To ensure this message is received, hand held devices will vibrate when there is a red warning. This product is continually developing and they are looking at ways that information, such as loss of pressure whilst in transit, will activate an alarm. Like iCheck, it has a full reporting system and captured data can be formatted in a variety of ways for analysis. As previously mentioned, retro fit patches are available, should you wish for the entire fleet to be compatible, although Michelin state that the savings made on just a partial fleet will be noticeable until the natural life cycle of the tyre means that the entire stock is RFID. Michelin will train workshop staff so that patches can be fitted in house. Despite the cost to the company, there is no additional charge for the RFID chipped tyre and they will be fitted as standard. Michelin believe that this is the way forward and want to encourage people of the benefits of having this system. The costing information was a little vague and my understanding was that iCheck and iManage costs between ¤1 and ¤9 per vehicle per month, but Michelin justify that by claiming that the performance from the tyre will be four times greater. In a previous article, I reported on how operator compliance is something that VOSA are looking at in terms of data sharing in the foreseeable future. Michelin have stated that they will not share data with any third party, but should the operator wish to, then the information can be shared as part of their vehicle maintenance and breakdown prevention programme. Naturally the subject of security was raised and Michelin were keen to emphasise that their system was safe and secure and that they were legally compliant with any data handling and its protection. The information is sent over to a cloud server where the team at Michelin analyse it and send it back in a format that the operator can understand. The idea is that the workshop/transport manager spends as little time as possible collating data but can access what they need at any time and most importantly, retain ownership of it. The company has invested in training their sales force on all of these products and have engaged the help of a number of experts.